I'm trying to decide which winter boot to get this year, and so far it's between a traditional pair of snow boots from LL Bean and a clog-boot hybrid that looks amazing but probably wouldn't be so practical for the snow. 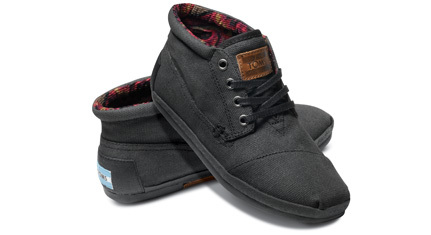 However, I'm also loving the Maestra Botas from Toms Shoes. Not only does the company donate a pair of shoes to a child in need for every pair purchased, but they also make durable and affordable foot wear. The Maestra Botas are pretty stylish too, and they look incredible comfortable. At $79 the black pair just might be the one.